It’s been yet another flawless basketball season for our project management team and our engineers in the field. Since late last year we’ve been covering college hoops across the country, week in and week out. And now it’s time for our shot at the Big Dance! Here’s a glimpse of all we’re up to as March Madness has officially begun. Dave Mitchell was the first one to kick things off at the First Four in Dayton, OH, this week. He’s been reunited with his Arizona truck – following some nice upgrades from our team in Orlando – and has hit the ground running at UD Arena for the prelude to the 64-team bracket. Mitch and all of our basketball crew are working closely with our friends at CBS and Hammond Communications to provide extensive transmission services for all the tourney locations, including press conferences, game backups, record and playout services, March Madness contribution feeds, and much more. For the first round, Steve Hagerty’s rocking and rolling at the Nationwide Arena in Columbus, OH. Rick Kolinek is at Wells Fargo Arena in Des Moines, IA. Ron Ford’s at the BOK Center in Tulsa, OK.
Steve Toth and the K38 truck are at Colonial Life Arena in Columbia, SC. 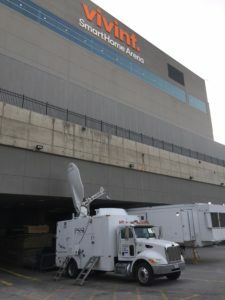 Mike Howley and the NT22 truck are at the XL Center in Hartford, CT.
Justin Roszak and the NT33 truck are at the Veteran’s Memorial Arena in Jacksonville, FL. We’ve got even more going on out west, as we add large aperture C-band game transmission trucks to the Hammond extravaganza. Brian Blomstrom and Todd Harvey are within a stone’s throw of each other at Vivant Smart Home Arena in Salt Lake City, UT, providing multiple feeds for multiple customers. 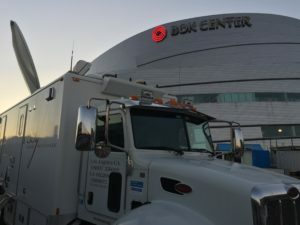 And at the SAP Center in San Jose, CA, we have another side-by-side setup of Ku-band and C-band trucks, as Steve Chaisson and Dave Brin handle the later games on CBS’s multiple platforms. You may know someone who put a few dollars behind their bracket to make things even more exciting. In Las Vegas, we have the CK35 mobile teleport parked at the MGM Grand all week to provide C-band and Ku-band transmissions for live broadcasts of Fox’s “Lock It In,” which features the picks of some of the smartest oddsmakers in the world. Joe Cox and Matt Huennekens are paying extra close attention to their feeds so they can make the sure bets this weekend. Of course it’s not just the men’s tournament that’s keeping us busy. Nick Ray and the Wolfcoach truck will be at UConn’s Gampel Pavilion at this weekend for the NCAA women’s tournament. NIT, too! Dennis Smith will heading down to Greensboro, NC, this weekend for ESPN’s coverage of the second round of the NIT tournament. While he’s down south, Dennis will also pickup an NCAA women’s softball game at Longwood University in southern Virginia. Of course there’s a lot more hoops to come next week, as we’ll be well-represented in round 2 of the big tournament, plus more NIT and women’s action to boot. Stay tuned! AAF football is heating up in the ratings and for PSSI Global Services, as well. This week we have a presence at all four games! We always have a hand in the pregame and halftime shows of every AAF game, and this weekend is no exception. Paul Blomstrom is taking the controls of the K34 production/uplink truck outside Sneaky Big Studios in Scottsdale, AZ. Paul will EIC the remote, virtual set productions for the AAF desk shows, as well as providing backup transmission paths out of the K34’s antenna for multiple games. 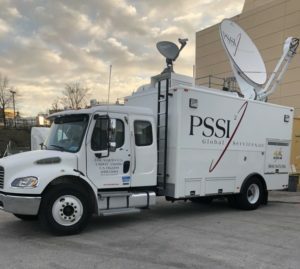 Mark Huss will be inside the building providing engineering services for the inbound feeds from our remote trucks via the PSSI International Teleport (PIT). We’re in Atlanta for the first time this weekend, as Kevin Spangler will be providing a multiplexed at-home transmission of the game between the Orlando Apollos and the Atlanta Legends. Rick Ball’s doing yet another one of his at-home transmissions plus data over satellite up in Memphis at the Liberty Bowl, where the Birmingham Iron are in town to take on the Memphis Express. 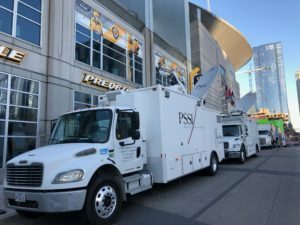 Our team at PIT will be ingesting these transmissions and handing off to the AT&T Global Video Services fiber pathways to Sneaky Big, where Mark Huss will decode and hand off the signals to production crews there. The teleport also provides Rick with his IP bandwidth so that the production crew in Memphis can talk with the crew in Scottsdale. Still more – John May and CK48 are down at the Alamodome in San Antonio, TX, as the Salt Lake Stallions are in town to take on the Commanders on Saturday night. And Larry Sheets is in the CK35 mobile teleport at Sun Devil Stadium in Tempe, where the San Diego Fleet are in town to take on the Arizona Hotshots. It’s a big weekend in Arizona for us. David Meyer’s getting a little sun as he covers the last couple spring training games on our schedule. On Friday David’s at Sloan Park in Mesa, AZ, for MLB action when the Texas Rangers take on the Chicago Cubs. Then on Sunday he takes the NT25 over to Peoria Sports Complex in Peoria, AZ, for more baseball, as the Chicago Cubs face the San Diego Padres. Wes Hill and the C49 truck are down in the Phoenix area, too. Wes is providing Golf Channel with a multi-channel transmission from the Wildfire Golf Club at Desert Ridge. It’s the LPGA Bank of Hope Founders Cup, with a prize purse of $1.5 million. Still more in Arizona! Senior engineer Tracy Michaels is heading to Phoenix this weekend to set up for the NFL Network’s coverage of the annual NFL Owners’ Meetings at the beautiful Arizona Biltmore. Tracy will be utilizing most of the Atlas truck’s considerable production and transmission infrastructure to provide the NFL Network with multiple cameras multiplexed back to headquarters in Culver City, as well as extensive production comms for our crew there at the Biltmore. Couple of big fights this weekend. We have a great crew setting up at the Bridgestone Arena in Nashville, TN, for UFC Fight Night 148 on Saturday night. John Bright, Mike Lemieux, and Benny Griffis join project manager Keith Valeri to provide extensive domestic and international transmission services for our friends at Concom and UFC, including Friday’s weigh-in, all the undercards, and the main events that will feature Stephen Thompson versus Anthony Pettis and a welterweight battle between Curtis Blaydes and Justin Willis. Blake Blomstrom and the C42 truck will be at the MGM National Harbor Casino in Oxon Hill, MD, for Sunday’s Premier Boxing Championship on Fox. Former WBF-IBC super lightweight and welterweight champion Lamont “Havoc” Peterson battles former WBC lightweight champion Sergey “Samurai” Lipinets in the main event. Blake will provide our friends at Fox with a multiplexed transmission with feeds for domestic and international distribution. Back out West, John Jennings continues his streak of youth-oriented events and awards shows as he provides MTV with a C-band transmission of the 32nd Annual Kids’ Choice Awards, live from the Galen Center on Saturday night, featuring host DJ Khaled. And last, but never least, we are racing. Gary O’Donovan and the NT23 truck are back at the South Georgia Motorsport Park in Adel, GA, this weekend for the Duck X Sweet 16. Gary’s there to provide data over satellite to the production crew there so they can stream live races all day long. Senior engineer Craig Henry is back in the NASCAR rotation alongside mainstay Ben Bradshaw at Martinsville Speedway in Virginia this week. 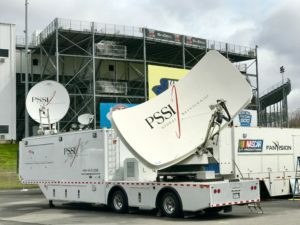 Craig and Ben are at the controls of the C27 mobile teleport, providing fiber and satellite transmissions of the STP 500 on Sunday as well as a whole host of races leading up to that.